On July 20, Ambassador Roger Noriega, Former Assistant Secretary of State for Western Hemisphere Affairs (2003-2005), and Virginia Bouvier, Senior Advisor for Peace Proccesses at USIP, discussed the current state of affairs in South America. Ambassador Noreiga and Ms. Bouvier described recent advances in the Colombian peace process, the situation in Venezuela, the political and health issues in Brazil, and other issues facing South America. This is an off-the-record discussion for Congressional Staff. Virginia Bouvier is senior advisor for Peace Processes. She joined USIP in January 2003 and has headed USIP’s Colombia team since 2006. She was seconded in 2012-13 to serve as a process design expert for the United Nations Standby Team of Mediation Experts. For the previous seven years, she was an assistant professor of Latin American literature and culture at the University of Maryland. From 1982 to 1989, Bouvier served as senior associate at the Washington Office on Latin America, where she focused on Bolivia, Chile, Paraguay and Uruguay. Bouvier has also served as a consultant and research director for the Women’s Leadership Conference of the Americas, a joint project of the Inter-American Dialogue and the International Center for Research on Women, and as a consultant for USAID, UN-Women, and World Bank. Her areas of expertise include Colombia, mediation and peace processes, conflict analysis and prevention, civil society, and gender and peacebuilding. 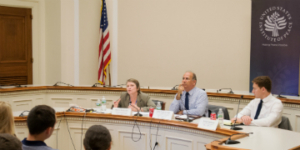 This was the 31st event in the USIP/PSA Congressional Briefing Series – Topics on International Conflict Resolution and Prevention, an educational program designed to provide congressional staff with opportunities to engage leading experts and fellow Capitol Hill staffers in bipartisan forums. The program aims to build cross-party relationships, encourage bipartisan dialogue, and equip staff with new perspectives on critical issues in international conflict, resolution and prevention.